Ray Philpott finds out how a well thought-out free school in inner-city Leeds manages to look so strikingly different despite working to the rigours of the Government’s school building programme. When it opens for business next year, the Ryder Architecture-designed Ruth Gorse Academy will be the largest free school in the country. But the £17.3 million academy actually sits on a highly constrained urban site in a traditionally industrial area of Leeds, posing interesting design challenges requiring smart solutions. For starters, the state-funded, privately run school is being constructed on the storage site of a former chemical works in a once heavily industrial area south of the city’s River Aire. The building is directly bordered by Black Bull Street – a major arterial road – some recent residential and commercial developments and a number of low-grade industrial units. It is very near the former Tetley brewery site and adjacent to the newly developed Leeds Docks, formerly known as Clarence Docks. Leeds City Council is regenerating this area, now named Leeds South Bank. Here it aims to attract commercial and retail development and create an environment that will attract families to live in a city centre that has become the domain of young adults and professionals. 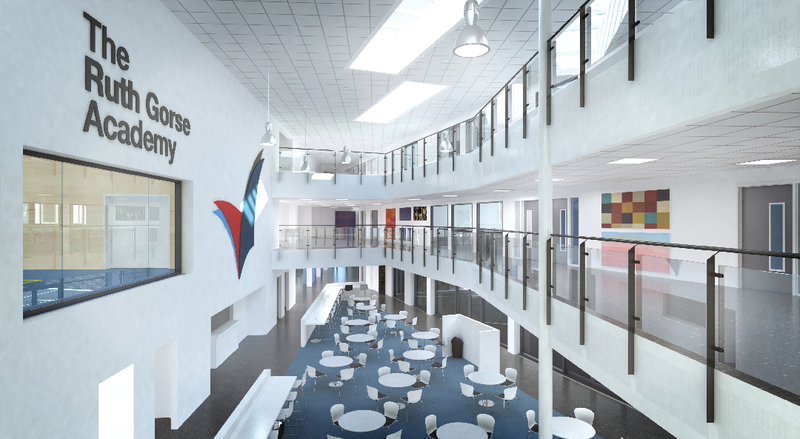 However, there’s a shortage of secondary school provision in the area, so the new academy – which will accommodate 1,580 students when full, and run by The Gorse Academies Trust charity – forms a vital element of the regeneration programme. 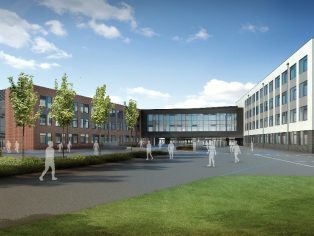 Not only is the site itself challenging, but as a state-funded new school, it has to be built to a very tight 12-month timescale within the well-defined specifications and standards of Phase 2 of the Government’s Priority Schools Building Programme (PSBP) under the auspices of the Education Funding Agency. These clearly specify everything from daylight requirements to air quality, while the tightly monitored budgets can limit the range of products and materials that can be used. 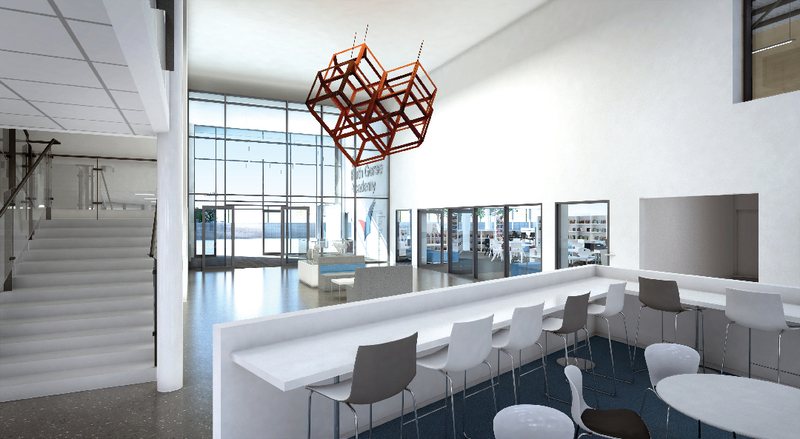 However, Ryder Architecture has succeeded in creating a building that is neither uniform nor dull. Despite the restricted size and slightly awkward shape of the site, the architects have designed a four-storey building with a highly efficient footprint. In essence, this consists of two traditional ‘finger blocks’ with classrooms and educational facilities projecting out from either end of a four-storey ‘super block’ known as ‘The Hub’. 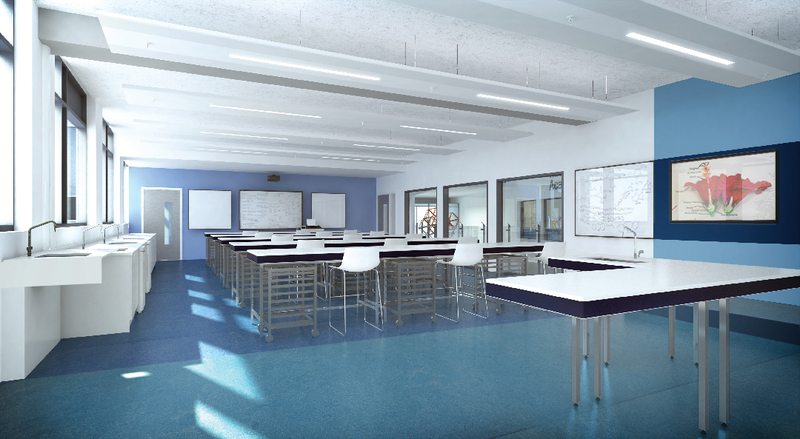 These three elements are connected to each other through a high-quality, glass and steel ‘spine’ comprising a large, circulation area under a large atrium and boasting showcase facilities such as the science laboratories and art studios. Viewed from outside, the three-storey spine and two finger blocks form the boundaries of a courtyard-style play area, while elements of the spine building overhang the courtyard to form sheltered recreational areas. Maximising recreational spaces is vital given the naturally constrained nature of the site. But it is the innovative formation and structure of the hub which is most central to the success of the buildings, as Grant Sellars, Ryder associate explains. “The planners and client were not keen on the idea of the traditional EFA standardised super-block, although it would have provided an efficient building form. Each element has a distinctive appearance, with its own pallet of colours and materials reflecting the external environment it is adjacent to. The humanities finger block houses the english, history, geography, arts and music departments, among others and is finished in a grey composite cladding, white-coloured render and a brick plinth for solidity and reflects the residential side of the site which features new flats. The three-storey ‘stem’ finger block runs parallel to Black Bull Street and is home to science, technical, and maths facilities. It features an entirely brick skin and, to give the roofline some movement, it incorporates a factory-style saw-tooth roof profile and window styles echoing the site’s industrial heritage. The saw-tooth roof element is made from lightweight cladding on a lightweight metal frame. The block is also more sealed off from the external environment as it sits alongside the main road. In contrast, the exterior of hub is comprised of glossy black composite panels using the Euroclad F5 system; these and the tall narrow windows deliver strong vertical lines. On the ground floor of the hub, the Learning Resource Centre (LRC) has its glass frontage facing directly onto the road, set back slightly from the pavement, making a public statement that this an educational building. It also reinforces the school’s links with the nearby Leeds College of Building and Leeds College, forming part of an education hub in the South Bank area. Ryder’s smart and innovative approach has undoubtedly avoided the uniformity and lack of imagination that can accompany many PSBP projects. “The pallet of brick, render and composite cladding is in no small part driven by budget and, to some extent, you could argue there’s rather a lot going on; but we’ve created something that is a reaction to different elements,” explains Sellars. Notwithstanding that, PSBP criteria presented a particular challenge in terms of air quality in the stem block as it is located on a busy road. To meet the requirements, service areas were located along the roadside facade and some parts of the block draw their air supply from the courtyard area. Strict daylight requirements saw a stringent approach to fenestration, involving high window heads and a large proportion of glazing to each classroom. “However, as the academy is not part of a batch of PSBP schools there was a little more flexibility to work with the academy to define and develop its school-specific brief while achieving the elements of the EFA output specification,” explains Sellars. Another aesthetic enhancement, attractive coloured opaque panels on the windows of the stem block, may eventually be used to represent the school’s brand colours. The school’s perimeter also has some nice features, with a part of it incorporating attractive brick piers from the original factory wall, complete with their original Yorkshire Chemical Works Group crests and parapets but with modern metal railing in between. Retaining this historic feature enables people to see in and out of the site, connecting the academy with the community. 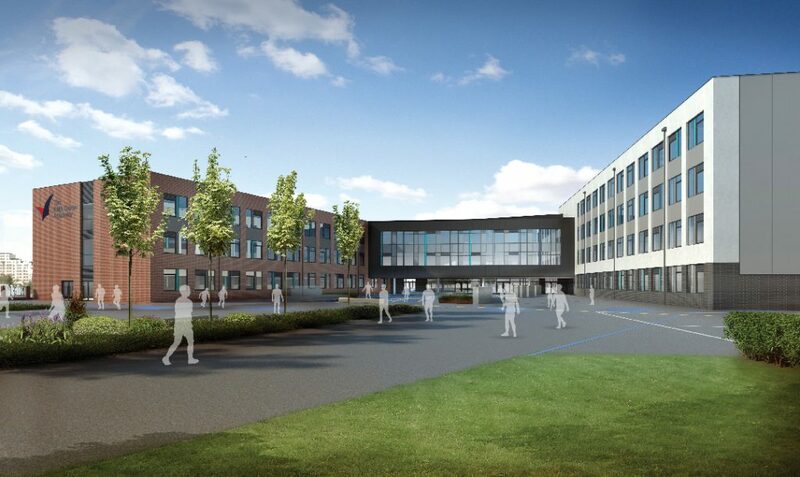 Typically, under PSBP-related programmes, the main contractor has a significant input into the design of the school and, from the outset, Ryder has enjoyed a strong a working relationship with main contractor BAM. “It’s been a fully collaborative partnership. BAM has provided a lot of valuable, practical input regarding the efficiency of the scheme and working closely together to tackle access and phasing issues of the programme to be sure it will be delivered on time,” says Sellars. Although it’s early days yet, on paper, the school’s sustainability and green credentials look good. Some 15 per cent of its electricity consumption will be provided by photovoltaic panels while heating and cooling is achieved through a highly energy-efficient heat recovery system used throughout the school, apart from a few ICT-intensive areas. The building’s BREEAM pre-assessment is currently targeting a Very Good rating with elements of Excellence, thanks to the generally high level of thermal insulation and air tightness. 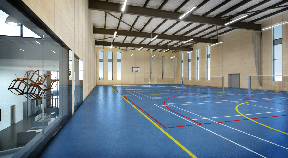 Ryder’s approach to designing the Ruth Gorse Academy shows that, with attention to detail and careful planning, it is possible to design a state-funded school that is so much more than just another run of the mill, ‘built by numbers’ modular building. Ultimately though, it is the students and staff who’ll benefit most from this thoughtful design when they walk through the school gates.